Meatless Fridays during Lent are a challenge for me. Well, breakfast would be as easy as oatmeal, except with Whole30 I’m not eating grains or dairy either (or fauxtmeal). I’ve been craving sweet potatoes for breakfast ever since I made the skillet sweet potatoes and sausage last weekend. Oh yeah, I’m not eating white potatoes either. However I like sweet potatoes better anyway. They’re so much more flavorful than white potatoes, and they are moist and creamy instead of dry and crumbly. If you’ve never eaten sweet potatoes outside of a sweeter-than-dessert sweet potato casserole, give them another shot. 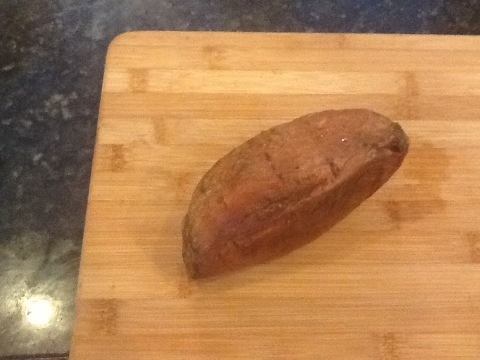 Bake sweet potatoes in a 400 degree oven for about an hour, or until soft. They only need the tiniest amount of butter and salt. They don’t turn out as well in the microwave, so bake several extra on an evening when you have can make enough time to cook them. Then you will have some extra to make amazing recipes like this one from PaleOMG. Juli is one of my idols. She’s a cool crossfit chick with witty Paleo blog full of delicious recipes. I changed up the recipe a little based on some of the comments and on the fact that Jewel inexplicably doesn’t like cranberries. I strongly recommend baking the sweet potatoes the night before. 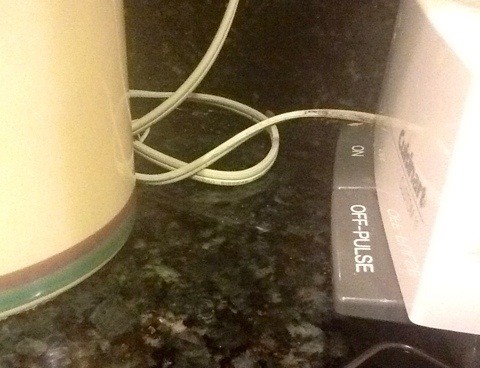 If you’re reading this in the morning thinking, “oh, crap,” never fear. There is so much flavor in this recipe that you can get away with nuking the sweet potatoes in the microwave until soft. Rotate them frequently so that they cook evenly. You can also carmelize the onion the night before. A low-effort way to carmelize an onion is to slice it, drizzle it with olive oil, and bake it with the sweet potatoes. Turn the slices every 15 minutes or so, or whenever you remember. If you haven’t done this yet, then sauté onion slices in a skillet in the fat of your choice until carmelized. Preheat the oven to 400. 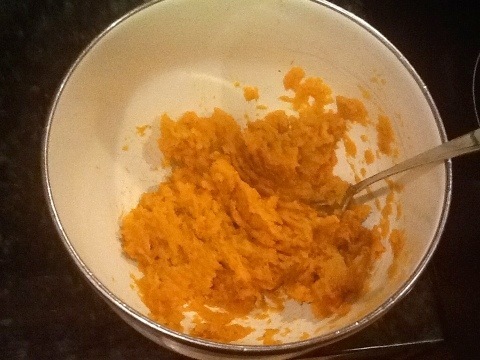 Mash the sweet potato in a bowl with a fork or potato masher. 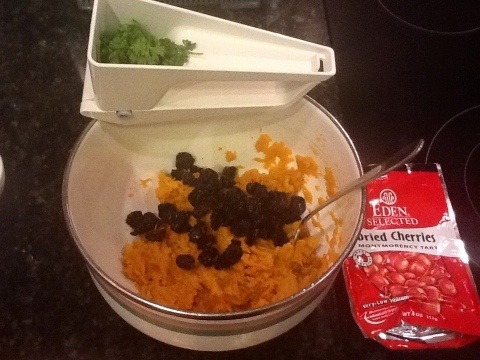 Add the dried cherries and chopped parsley. Next time I think I’d use just a 1/4C of cherries since they are sweeter than cranberries. My sister gave me this handy herb mill. If you don’t have one, kitchen scissors work better than a knife for chopping herbs. Don’t substitute dried parsley, which is completely flavorless. Also add granulated onion, salt and pepper to taste. If you don’t mind crunchy onions you could use chopped raw onions instead. Drink some coffee. 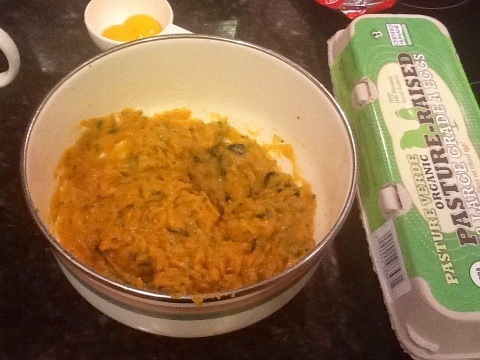 Separate 2-3 eggs, depending on the size of your sweet potatoes. 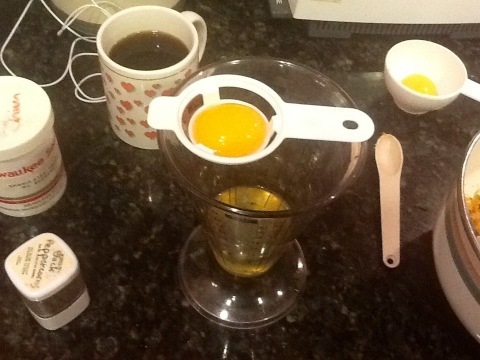 I have an egg separator, but for most of my life I separated eggs like this. Set aside the egg yolks. Do not discard! 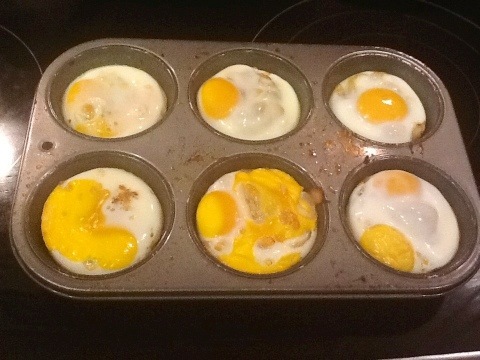 Did you know that pastured egg yolks are one of the few foods naturally high in vitamin D? This is a great way to get vitamin D during the winter months. Factory farmed eggs do not contain appreciable vitamin D because those chickens never go outside. Lightly beat the egg whites and add them to the sweet potatoes. 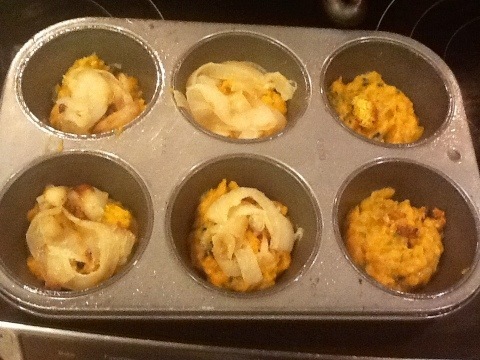 Grease a large muffin tin or 6 small ramekins. Add sweet potato mixture. Top with carmelized onions. Tom doesn’t like onions so I left them off his. If I hadn’t eaten the last slice of bacon in my Bacon Egg Tomato Avocado Salad the day before, I would have added pieces of bacon to his portions. Crack an egg onto each cake. 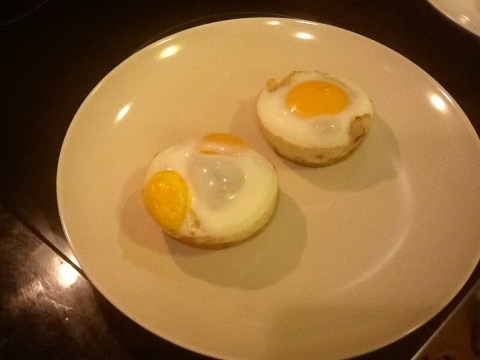 Top a couple lucky cakes with an extra yolk. 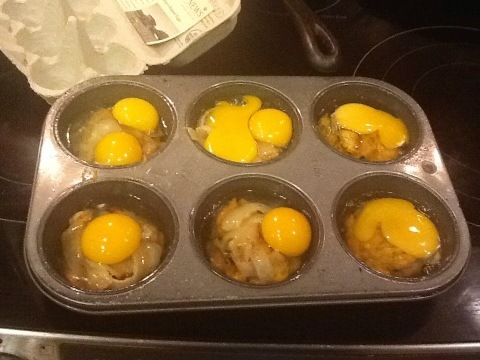 Bake for about 15 minutes, or until eggs are just cooked through. Check frequently. I started these out at 350 and then figured I needed to increase the temp, so I’m a little hazy on the cooking time. While you’re not looking, your daughter will snap a random picture of what your iPad is focused on. Ok, so the one thing I screwed up is that I didn’t take a picture of the cakes once someone took a few bites, because they look even tastier then. Do check out PaleOMG, because Juli has a gorgeous picture that will convince you to try these. I thought this breakfast deserved the OMG! It was such a great combination of sweet, moist, savory and eggy, and it was quite filling and extremely nutritious. This will definitely be a new regular breakfast. 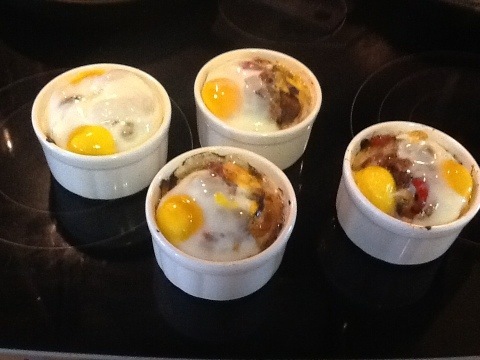 4/5/2012 edit: I made these again in ramekins. 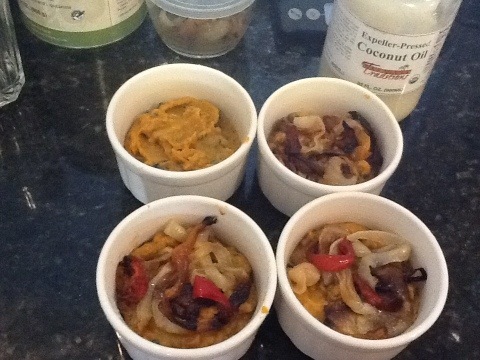 I used 2 extra-large baked sweet potatoes and divided the mixture into 4 servings. 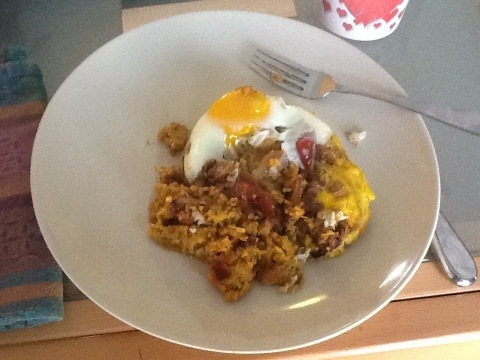 On Tom’s I added a piece of cooked crumbled bacon and 2 eggs. 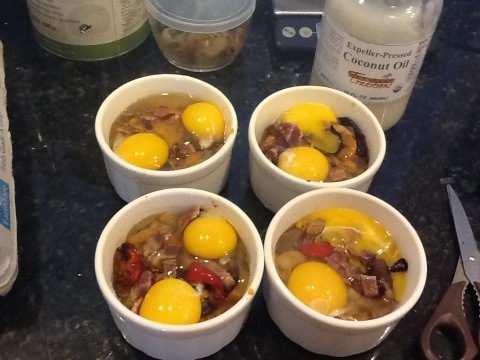 I divided another piece of bacon amongst the remaining ramekins and added carmelized onions and red peppers, one egg and one egg yolk. I baked these for 25 minutes on 400. The finished product is the top picture on this blog entry.